High blood pressure is a contributing cause of about 1,000 deaths a day – and one in every three American adults has the condition. About seven in 10 don’t realize it, putting them at risk for heart attack, stroke, heart failure, and kidney disease. About seven in 10 adults with high blood pressure use medication to control it. That’s according to the U.S. Center for Disease Control and Prevention (CDC). 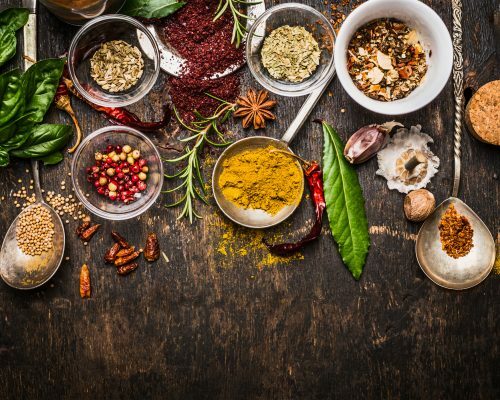 While we’re not quibbling with the necessity for medication to get blood pressure under control, there are natural remedies for high blood pressure, including spices and herbs that can help. Since keeping your blood pressure in the healthy range is something you need to do all your life, it’s better to control it without drugs, if you can. You’ve likely heard a lot about lifestyle factors that can have a huge impact on your blood pressure, like stress, alcohol, lack of exercise, smoking, and diet. The most important of these, in our books, is a heart-healthy diet. Focus on watching your salt intake (and balancing it with more potassium from foods like bananas, lima beans, melons, and squash), limit your sugar, and cut down on caffeine. As part of your heart-healthy diet, consider the following spices and medicinal herbs to lower high blood pressure. You can incorporate them into your cooking, baking, and meal prep – as a little extra something to help your heart. They’re nature’s way of providing us with the good things we need to stay healthy. This is good news for cooks and foodies. Versatile, fragrant basil for lowering blood pressure is a great addition to many culinary favorites. Tear some fresh basil leaves and sprinkle liberally on your next pizza or bruschetta, use for a Thai curry, or try it chopped and beaten into softened butter and melted over roast chicken or crushed boiled new potatoes. Try keeping a small of the herb in your kitchen garden (for easy, fresh access) and then it’s even more convenient to add to your cooking on a regular basis. Tasty, yes, and good for helping to lower your blood pressure. The U.S. National Library of Medicine reports that extract of basil has been shown to lower blood pressure, although only briefly. But that’s a start to get you on track. It may work in a similar way to medication by affecting levels of endothelins, which are proteins that constrict blood vessels. When blood vessels are constricted, blood flow is slowed down or partially blocked – not good! You need good blood flow for circulation and overall health. Your body depends on the nutrients and oxygen in your blood to be carried efficiently through your veins and arteries. Another kitchen staple and one of the top natural remedies for supporting healthy blood flow, this pungent seasoning brings wonderful flavor to foods. Add it fresh to your dishes, like soups, stews, and stir-fries. If it’s a little on the strong side for your preference, roast it first in the oven. Trim the end off the bulb and drizzle a bit of olive oil over each exposed clove. Then cover with aluminum foil and bake at 400 degrees Fahrenheit for about 30 to 35 minutes. Try spreading this deliciousness on party toasts at your next gathering. Not only addictive and good to eat, garlic can help with healthy blood flow (good for your heart and blood pressure). This seasoning comes from India (think fragrant chai tea) and is often used in traditional dishes of South Asia. It has a sweet flavor similar to grapefruit and ginger, if you can imagine that. Scientists in India have studied its effects on blood pressure, and recommend a teaspoon of cardamom powder taken with honey twice a day for healthy blood pressure. Other options? Include cardamom seeds or powder in soups and stews, spice rubs, and in baked goods for a kick and a positive health benefit. When it comes to medicinal herbs to lower high blood pressure, cat’s claw has been used in China for thousands of years. Studies have suggested its effectiveness. According to the U.S. National Institutes of Health (NIH), rhynchophylline, an alkaloid or certain organic compound in cat’s claw, has demonstrated an ability inhibiting both the formation of plaque on arterial walls and formation of blood clots in the brain, heart, and arteries. You’ll find cat’s claw in supplement form in health stores and supplement sections at your supermarket. Another herb popular in traditional Chinese medicine, celery seed has been used to help with hypertension. You can use the seeds to flavor soups, casseroles, and other savory dishes – and you can also juice the whole plant. It has a salty taste, making it a good mix with the sweeter fruit juices. Try carrot, apple, and celery first thing in the morning for a terrific pick-me-up. It’s a nutrient powerhouse in a glass. You might like it better than your morning coffee (we said might!). Celery in your diet can act as a natural diuretic, so its potassium and sodium content helps to regulate body fluids. It also has a nutrient called phthalide, reported to promote cardiovascular health. Flax seeds are rich in omegas which some studies have suggested may contribute to lower blood pressure numbers. One review suggested that 30 to 50 grams of flax seeds daily could provide blood pressure benefits after 12 weeks. Flax seeds have also been found to protect against atherosclerotic cardiovascular disease by helping to reduce cholesterol and improve glucose tolerance. Lavender extracts have been shown to improve blood pressure and lower heart rate among rodents. Lavender can be used in baked goods and the leaves can be used similar to that of rosemary. Or, you can simply use essential oils in a diffuser to allow the aroma to improve blood pressure by inducing calmness. These are a few medicinal herbs to lower high blood pressure. As you can see, going the natural route is an appetizing one. So start with your diet, and spend more time in your kitchen preparing fresh, whole foods and sampling these heart-healthy herbs and spices.